Kim from the wonderful PACT animal shelter took in three quite rotund waifs and strays at Christmas. 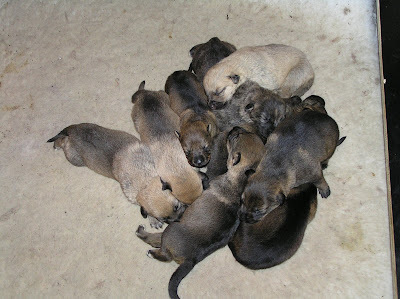 Two slimmed down but one got fatter and these nine lovely pups resulted. She describes them as Lurcher X Staffy X GSD X Collie X Miscellaneous! Mum is only a pup herself. There are 20 other dogs at PACT that Kim describes as sticky. 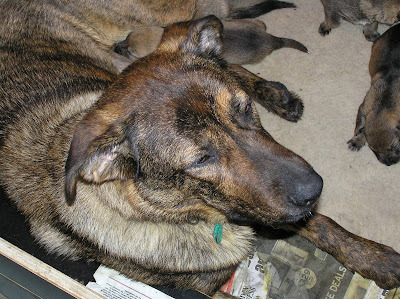 New beginnings indeed, hope mum and pups continue to do well, she looks beautiful as do her wee ones. I imagine all the pups will find new homes, they are so cute & young.